Yep, not my night! Just told my husband that I’ll clean up the kitchen and put away the rest of the dinner a little LATER – I don’t trust myself right now! The washing machine is merrily chugging away cleaning my two pairs of jeans and tops while I just S I T ; that’s about all I trust myself to do right now. Here’s hoping you all had a wonderful holiday; ours was filled with food, fun and family. There’s still a little turkey left which I plan on making into Turkey Divan for dinner tonight over cooked rice. There’s also still pumpkin pie, French Vanilla ice cream, cheese cake and about 3 servings of apple crisp (but that won’t last long…hehehe). Along with all the food preparations and holiday ‘stuff’ I worked on getting some of the projects finished that have been ‘bugging’ me (I don’t like half-finished projects that lie around and taunt me: “Hey! I’m HERE – FINISH me!! !” … nasty little comments coming from knitting, indeed!) 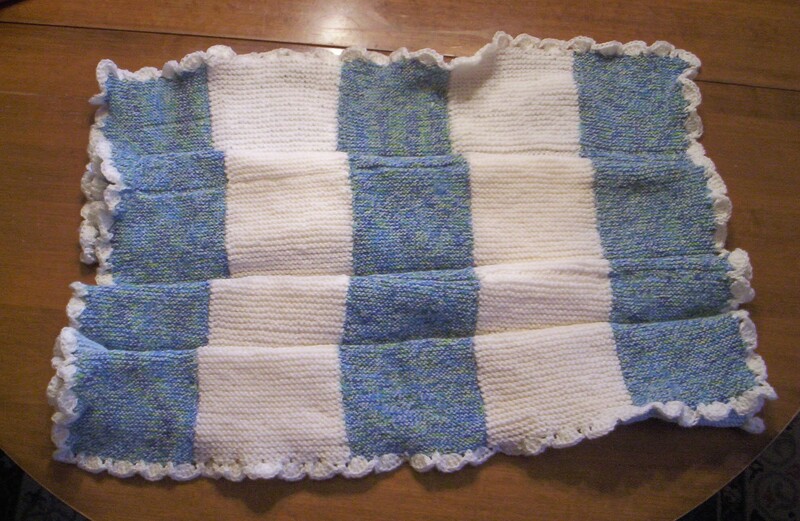 To start with, here is what I’ve been calling the “Australian Baby Blanket” – it is made from blue knit squares that were sent from Australia. 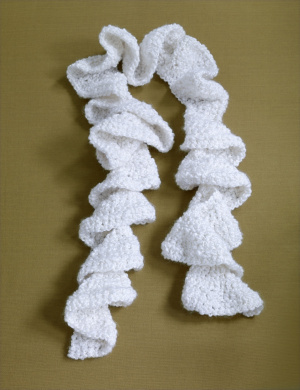 I knit white squares to make enough for a baby blanket for the “Club Foot Baby” section of Korle Bu hospital in Ghana. knit pair of fingerless gloves for one of our volunteers in my special needs group (modeled by my son, Eric). 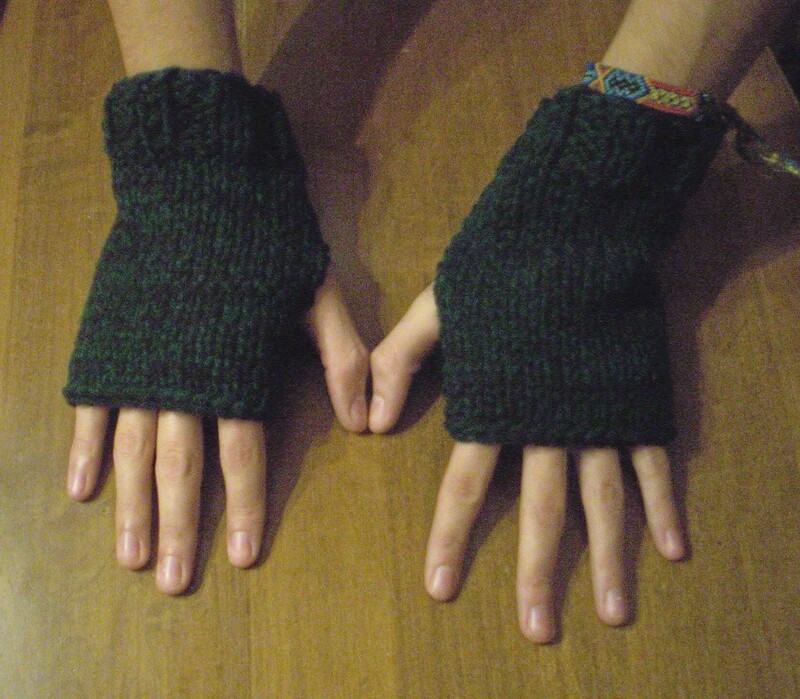 They are done in a dark green and black yarn mix (which doesn’t show up at all…sigh). The receiver of these gloves loves to text, so I thought the gloves would come in handy for him this winter. 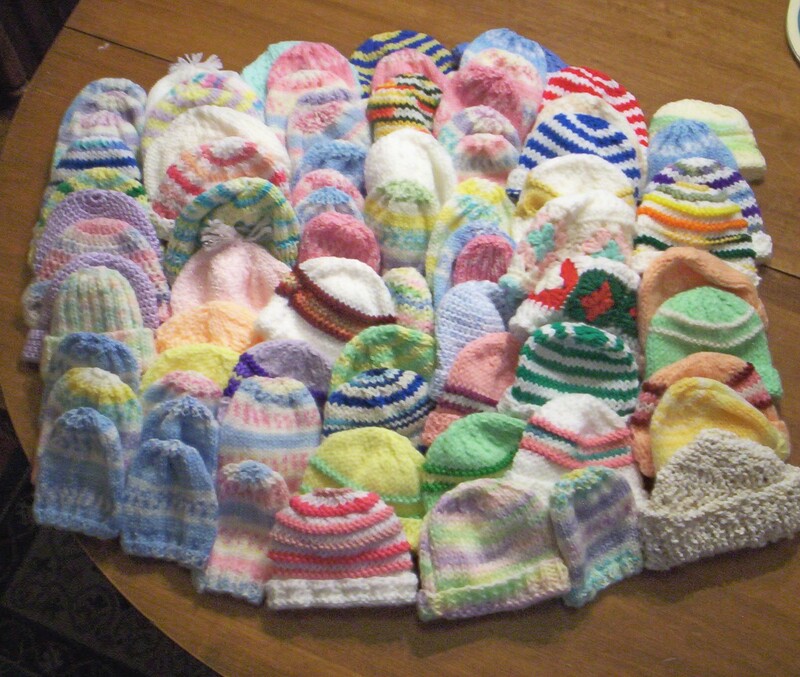 80 more premie baby hats knit & crocheted by Waterford-Area Knitters & Crocheters. These were just mailed off to: “Stitches From the Heart”, a worthy ministry that provides several hospitals in California with hats for their premies. It’s a very quick and easy pattern; I’m going to try to glance at her winter coat to see what color it is and maybe ‘edge’ the scarf in that color (I’m making it in white, so it goes with just about any color). Also finished another Ghana Project afghan (#265); also got a shipment of 91 squares from the ladies at “Ladies of Grace UMC” in Indiana, PA. I’ve got LOTS of squares, just gotta get sewing them together. It feels kind of nice to know that I only have the ruffle scarf to finish and my Christmas projects are done, then it’s only sewing squares together! Heat oil in a high-sided skillet or large saucepan on medium high. Saute the onions three minutes or until tender. Add garlic and ginger and cook one minute longer; add squash, potatoes, apple juice and wate . Bring to a boil ; reduce heat and simmer 35-40 minutes or until very soft. Puree in a blender or processor, in batches, until smooth. Pour back into pan and stir in milk and salt. Reheat and serve topped with garnishes. Serves 6. Well, that’s all I have for today – I’m sure there are lots of great recipes sitting in my “In” box and I’ll be putting them on here regularly. Hope you have a great day! It’s 50 degrees here, no snow, a little gray out but that’s fine…I can still drive and walk in ‘gray’! One More Day to “Turkey”! vanilla bean, orange zest, orange juice, and salt. 1 1/2 cups milk and stir gently over medium-low heat. Serve warm, sprinkled with the brown sugar if desired. thyme, salt, and a few grinds of pepper and toss well. medium pot and add enough water to cover by 1 inch. tender when pierced with a skewer (20 to 30 minutes). Scoop out a half cup of cooking water for later use. from heat and return potatoes to the pot. reheat if necessary and serve. sauce; stir until mixed. Stir in cold water. Pour 2 C.
slightly thickened (consistency of unbeaten egg whites). Add Cool Whip; stir with wire whisk until well blended. until potatoes are tender. Drain; return to saucepan. water to cover; 12-14 min or until tender. mixture is bubbly, stirring occasionally. to desired consistency, stirring frequently. and green onions. Makes 6 servings, 1/2 C.
blended. Makes 4 servings, 1 1/2 C. each. Got up early today to finish up the ‘last minute’ food purchases – bread, milk, eggs – the necessary ‘stuff’ to have around when the whole family will be home for several days. I’m so thankful that yesterday’s plumbing ‘fun’ was so easily taken care of by ‘the snake’ – not bad expense-wise either – we were truly blessed. I’m thankful that the Lord takes care of the big things as well as the little things in our lives. Tonight is Knit Night and it’s getting so that I’m almost apprehensive about going – simply because our group is growing so fast! I’m the one who gets there about 25 min. early to set up the chairs & tables (I should say ‘re-arrange’ – love the looks I get from other customers when I come in, plunk down my ‘stuff’ then start shoving chairs & tables all over the place to make one really long table – it’s a good 30 feet when I’m done and seats about 25-30). Tonight I’m taking the camera – it’s about time I remember to photo the ladies (& Brian, our resident guy knitter). It’s also the deadline for several different ‘turn in’s of knitted/crocheted charity items, so I’m guessing we’ll have a pretty big group again. Place graham crackers in a food processor and process until finely ground. Add 1 Tbsp. sugar and butter and process until crumbs are moistened. Press mixture evenly across bottom and up sides of a 9-inch pie plate, packing tightly. Bake until crust is crisp, 6 to 8 minutes. Cool completely on a wire rack. incorporated. Stir in sour cream and vanilla. Scrape down sides of bowl and stir until combined.Scrape half of filling into prepared crust. Dollop half of cranberry puree on top of filling. Top with remaining filling and then puree. Use a knife to swirl puree through filling, creating a marbled design, taking care not to drag crumbs from crust into filling. Place pie on lined baking sheet and bake until set around edges but still slightly jiggly in center, about 35 minutes. Transfer to rack to cool completely, then loosely cover with plastic wrap and refrigerate for at least 4 hours and up to 2 days. Preheat oven to 375F. Combine first 8 ingredients. remaining syrup. Sprinkle with white chocolate. casserole. Cover and cook on LOW 30 more minutes. mixture. Bake 30-35 minutes or until set. Cool 10 minutes. your day sets forth for you! gleaned them from various other recipe sources. Here I sit, as the title tells you, ‘waiting for the plumber’. Now, earlier a plumber did come by and replaced the short 2 feet of old cast iron drain which was causing the leak however . . . the clog lies somewhere between where the new section of PVC pipe is and the cast iron piece which is kind of ‘in the wall/ceiling of the basement. Oh joy… said plumber said that he doesn’t have a ‘snake’ in his truck and another guy will be by to try to snake out the drain – that was 2 hours ago (he said about an hour) and so I wait. What do YOU do when you’re waiting? So far I’ve finished the Christmas scarf for my friend; the photo below doesn’t really do it justice – it’s a soft, fine Federal Blue yarn and a ‘1 row pattern’ (very easy). 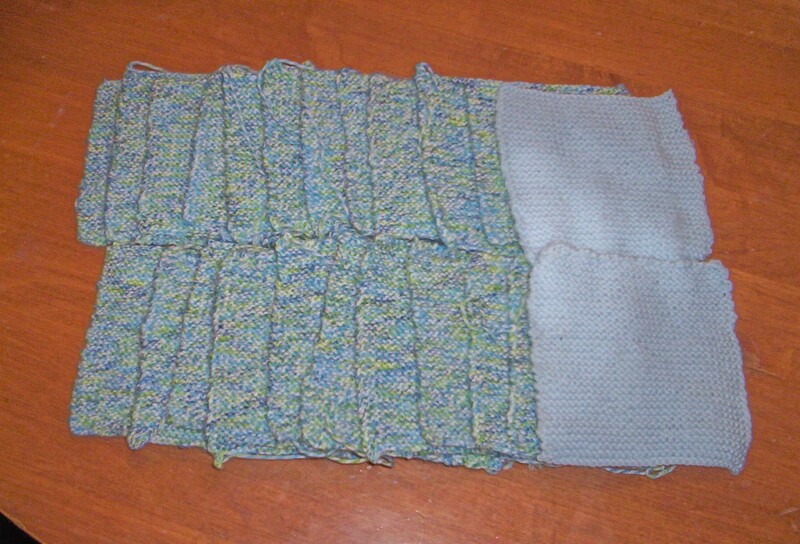 Also managed to sew in six more of the thin blue/white squares for the (Australian knit) baby blanket; still have six more blue and four more white to finish, then edge it and that’s a done project. Yesterday at church a friend handed me a small (toddler sized) pink baby sweater which had at least 6-8 holes in it. She volunteers at the local shelter and that was a donation. Knowing I like to tackle strange projects she asked if I could repair it; consider it ‘done’ – another ‘waiting for the plumber’ job done. Well, now I’m writing a blog – another ‘plumber’ job. There are more tasty recipes just waiting to be posted, so I won’t dawdle! just until moistened. Transfer to a greased 9-in. x 5-in. loaf pan. from pan to a wire rack. In a small bowl, combine butter and pineapple. Serve with bread. Yield: 1 loaf (16 slices) and 1 cup butter. buttermilk to creamed mixture. Add raisins and nuts. tin, bake 25 minutes.Makes 4 dozen small or 2 dozen large muffins. brown sugar, and orange rind. Blend well and put into large greased casserole dish. Into a saucepan put 2 oz. margarine, 7 oz brown sugar, milk and pecan pieces. Bring to boil stirring constantly till thickened. Pour over sweet potatoes in casserole and bake at 400ºF for 20 to 30 minutes. In a small saucepan over medium heat, cook and stir cranberry sauce, mustard and orange peel until blended and smooth. Remove from heat. Meanwhile, Grill (or broil) Chicken for about 20 minutes or until juices run clear. Brushing with sauce during last 10 minutes of grilling. Well, that’s the ‘scoop’ for today – hoping to have a fully-functioning kitchen sink by the end of the day – without it, sure makes for a ‘fun’ time trying to figure out what to cook that won’t use a lot of pots/pans/dishes (that can’t be washed easily!). Our weather today is sort of typical November – chilly, grey and raining. I lit a caramel candle while I was working on ‘the projects’ – that sort of made the room feel/smell a little warmer. Enjoy your day – what EVER weather you have! I realized today that it’s been awhile since I’d gone through my emails and weeded out the recipe lists – those that are what sound like ‘keepers’ and those that are either too fussy, too many ingredients, too long a process, etc. What I was left with was a pretty long list of really great sounding recipe! Some are crockpot, some are Thanksgiving/holiday – you can decide which you might want to try. Remember these are NOT my personal recipes, only ones I’ve gleaned from various recipe sites. Since there are so many, think I’ll be posting some for the next few days to give you a chance to go buy ingredients if you feel the urge to make them for the holiday coming up! a tester comes out clean, about 30 minutes. Let cool on a rack for 1 hour. over turkey in the slow cooker.Cover slow cooker, and cook turkey 8 hours on Low. Now that you’re drooling all over your keyboard, I’ll let ya go. Have more good-sounding recipes coming in the next few days! Against my better judgement, I decided to stay up WAaaaaaaaay past my bedtime last night and watch “The Golden Compass”; had just read the book and wanted to see how they portrayed it in the movie. It was ‘ok’ – they really compacted a lot of the parts and totally left off the ending – maybe they wanted to connect it to the next book/movie? My husband came out about half-way through and watched it to the end with me; both of us dragged off to bed at 2:45 a.m. so I’m REALLY dragging today! Woke up but really didn’t want to ‘get up’ – took another hour to just get ‘with it’ enough to function – not going to be a very productive day I’m guessing. Yesterday was one of those ‘get things done’ days: worked on setting up three more afghans and sewed two rows on first of those. Have decided to knit another scarf for the President of our special needs group, so that’s almost half done (knit in a Federal blue, very thin acrylic/mohair yarn in a one-row repeating pattern). 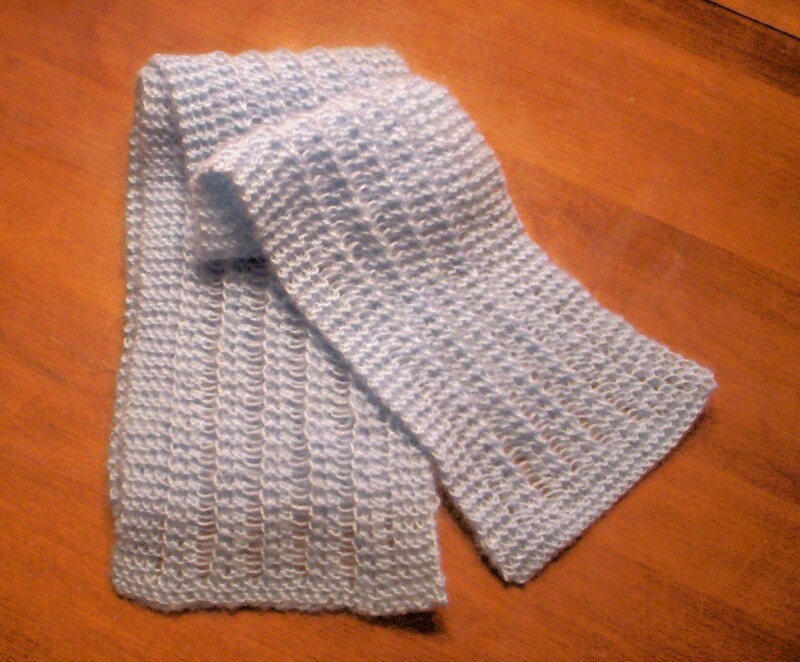 Am thinking about also knitting a simple winter scarf for one of our volunteers but haven’t started it yet. Am still tossing around what to give to my members of the knit group as a little ‘thanks’ present – there are now over 30 people who are active, so any present I make/buy will run a bit in cost; haven’t actually found an idea yet (except I bought 2 bags of mini candy bars…now need something to ‘go’ with them). Last year I knit tiny pins, but that takes a long time and I just don’t have the patience this year. Oh well…we’ll see what happens there. Am down to 5 white, tiny squares left to knit on the Australian-knit baby afghan; that should go fairly quickly. Oh! On the ‘fun things’ scene -our kitchen sink drain pipe decided to plug up Thurs. and (to save a very long explanation) finally sprung a major leak, we’ve been struggling along without being able to use the kitchen sink until the plumber comes on Monday a.m. Not a HUGE struggle, but it certainly makes you THINK before doing any cooking – we had enchiladas last night (a good 2-night dinner); am thinking of spaghetti & meatballs for the next 2-day meal. SO glad this didn’t happen say Wednesday? Not sure what the cost of replacing that old iron pipe is going to come to, but whatever it is – we need the pipe, so it’s a ‘wait and see’ situation right now. How are you coming on your Thanksgiving preparations/plans? I’m about half done with the buying, still have more ‘to go’. I know that Kroger had turkeys for 29 cents a pound if you bought an additional $20 in groceries (I didn’t take advantage of that last Monday, but might do that today – I always try to keep one turkey in the freezer so this would make an ‘extra’ perhaps for Christmas?). Still having trouble adjusting to the fact that we’re so close to Christmas! My ‘present buying’ is VERY thin this year (I mean – the ones I’ve already purchased). As per usual around this time, I don’t have a clue what to buy… am thinking marbles and a big metal dump truck for my grandson. I know – those sound like weird presents BUT those are the two things he loves to play with most at my house (and told me he doesn’t have either at any of the ‘other houses’ – Dad’s, Mom’s, other Grandma’s and Great Grandmas). Speaking of my grandson, we had a great time this past Thurs. playing two games I dug out of the closet from when his Daddy was a young boy: “Don’t Wake the Dragon!” and “Pizza Party”. Of course, he won more games than I did – something like 9 to 2, but he really had a great time with them, so glad I kept them. There’s still “Pen the Pig” and “Peanut Butter and Jelly” – I used to love to play those games with the boys and they haven’t lost any of the ‘fun factor’! Well, it’s time to wrap this up if I’m going to get anything done around here today. Still have the ‘fun’ job of attempting to wash some dishes in the bathtub using a big bucket – fun, fun, fun. (I also have the possible trip to Kroger to think about – not sure if they’ll have that 29 cent offer come Monday…). Enjoy your day and your weekend! Hope your weather is good – it’s around 45 degrees, chilly but sunny. Hey – it’s better than rain or that nasty white stuff!!! Today it’s bright and sunny, about 44 degrees F. and a very fine Fall day! Our weather this past few weeks has definitely been out of the ordinary for this time of year in Michigan – we’ve been experiencing, I’m guessing, an over-extended “Indian Summer” (don’t get me wrong – I LOVE it!) I’ve read and heard that we might be in for a very hard, long winter so any extension of warmer, sunny weather has me excited! It’s Saturday and I’m trying to use this day to catch up on a few things I’ve sort of let slide: finished afghan #263; that makes 15 afghans for this trip to Ghana – quite a bit less than my usual 25+, but I’m trying to ‘pace myself’ this time. Have completed several other charity knitting projects; just finished another two childrens hats for our local Historical Society’s Christmas sale and mailed out the baby presents to my best friend’s daughter in Ohio (that would be the 2 baby hats, booties, the ‘green bunny blanket-toy’, the large baby afghan, a bib and really cute teddy bear). I don’t believe I mentioned here that I’m also attempting to complete a baby afghan for Ghana (not this trip); the hospital there also does club-foot baby surgeries. A few weeks ago I received several packages in the mail from a lady in Australia containing 5″ x 5″ knitted squares. Mind you, I’m not complaining, but these particular squares are 2 inches too small for my regular Ghana afghans and she knit them out of what looks like sock yarn (which is much thinner than the usual worsted weight of the other squares). This presented a possible problem but because I didn’t want to ‘waste’ these, I found a similar weight white yarn in my stash and have been knitting squares to compliment the thin, small blue ones. When I’m done it will be a blue & white striped baby blanket for the club-foot baby section of Korle Bu hospital, in Ghana. (I’ll try to remember to take a photo when done). Also on the home front, my knit group is growing by leaps & bounds! This past Tuesday found us using almost every available table at Panera, with 24 members (the largest group to date!). Panera management is very gracious and welcoming to us but I’m concerned that if we grow any further (and we will, I’m sure) we’ll have to be looking for a new meeting place. One of my new members mentioned a local area church where their quilt group meets that would be a good location. For now, at least through the holidays, I’m going to pray on it and then make a decision. This past Tuesday I was expecting three new people (who had signed up on our website) and, instead, three OTHER new people showed up (the on-site ones didn’t come!). I’m thrilled to have new people join us; this is a ‘pleasant’ conundrum to have, I suppose-more people than you can adequately seat! I’ll keep you informed of the on-going events. My special needs group, as well, is growing by leaps & bounds. This past Wednesday we had over 50 people in our room (that’s counting students and caregivers). That, too, is the largest crowd we’ve ever had for a regular Wednesday program. Amazing! The Lord is truly blessing in both groups. Not much else new around here – tonight’s dinner is pierogies & Polish sausage. Last night was chicken stir fry which came out better than expected! (That’s always a good thing!) It seems like I’ve been cooking more than usual this past week but that could be because I haven’t had many evening events to shorten the dinner cooking (in that case I usually substitute hamburgers on the George Formann or sloppy joes – something quick to cook & eat). pour into crockpot. Cook on low for 6-8 hours or High 3-4. Serve in a bowl with ice cream. That’s it for today; hope you are all feeling in good health (Oh! Today’s the last day of the antibiotics – think the sinus infection in FINALLY gone!). Ok, ‘Pammie the Proud’ finally admitted she needed to see the doctor and went this past Tuesday; end result- antibiotics to get this ‘mild sinus infection’ gone! Now into day 3 and I’m beginning to feel more energetic-YAY! Finally culled the many MANY recipes sitting in my In Box and came up with what sounded the most warm, fulfilling and yummy; here ya go! is crumbled & lightly browned, 6 to 8 minutes. to a boil,stirring occasionally. Add salt to taste. mixture. Sprinkle evenly with remaining 1 cup cheese. top feels firm when lightly touched, about 15 minutes. from cooking. Add rest of cabbage, and top with cheese. with some cheese and chips.Makes 8 servings. Place first 3 ingredients in slow cooker, Stir together. beat until smooth. Spread over cake batter. DO NOT STIR! Bake 1 hour at 350°. Turn out onto tray. Coconut should be on top. Hope You Remembered to VOTE! It was a ‘balmy’ 36 degrees at 10 am. today when I drove to our local voting place. #144 was my voter number after the electronic ballot machine accepted my completed ballot. Quietly it sucked the long cardboard/paper into it’s gaping slot, waited a second or two them registered the number on it’s electronic face – #144. My husband was # 300-something when he went after work around 4 p.m. Even though we might not always agree on all political issues, it’s wonderful to be able to exercise our right to cast our opinions and VOTE! A friend of mine who has a foreign exchange student living with them said that the precinct where they vote allowed them to show the student the process – I think that’s great! We live in an amazing country – when compared to communist or dictatorship countries where it doesn’t matter what the people think or want; we are ABLE to make our voice known! Our voice and choice might not always be the one that wins, but we are able to express our thoughts without fear of being beaten, arrested or even killed. I hope that you were able to exercise your right to VOTE!